Following a six-way competitive tender, House of Fraser has appointed Norbert Dentressangle as its multi-channel fulfilment partner. The new contract recognises Norbert Dentressangle's proven multi-channel retail experience and capabilities, along with its ability to support House of Fraser's ambitious growth plans over the next five years. With annual sales in excess of 1.3 billion, House of Fraser is a leading national, premium department store group in the UK and Ireland, trading through a portfolio of 62 stores, as well as its rapidly growing web store. The company is at the vanguard of the multi-channel retail movement, becoming the first UK retailer to open stores specifically for click-and-collect operations in 2011, reflecting the growing demand from customers for more flexible shopping choices. Norbert Dentressangle will be responsible for the management of House of Fraser's 510,000 sq ft e-fulfilment site in Milton Keynes, including the receipt of goods from House of Fraser's National Distribution Centre, Concession suppliers and inter-store transfers, order picking, marshalling, packing, despatch and returns management. The operation currently involves the handling of more than 140,000 SKUs and several million items ordered per annum. The company will also be responsible for the collating, picking and packing of orders for House of Fraser's growing wedding gift list service. The 24/7/364 operation employs a core workforce in excess of 200 colleagues. 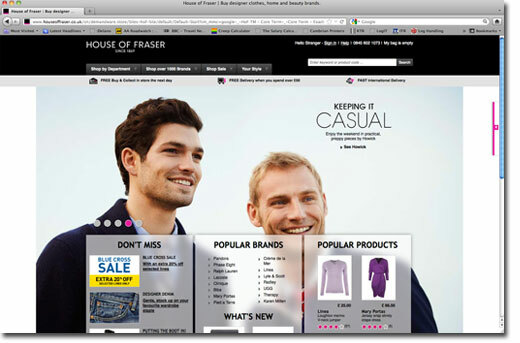 In addition to its proven track record in multi-channel fulfilment operations, other key factors in House of Fraser's decision included Norbert Dentressangle's proposals to improve both the processes and culture within the warehouse in line with House of Fraser's aspirations for growth, as well as the speed and proactivity with which the company approached the tender process. Mark Holland, House of Fraser's Supply Chain Director said: "I am very excited at the prospect of working with the team at Norbert Dentressangle to ensure that we have the platform to support the exciting growth plans House of Fraser has for its multi-channel offer. Norbert came through a very exacting process and are here on merit. "